Any suggestions for building an engine lift in the cockpit. 2X4 frame to attach a block & tackle to, Engine harness to attach a block to. Any suggestions please. The above link gives full instructions for pulling the 9.9s in the PDQ 32. I've done it ~4 times. No harness. Metric bolts screw into the flywheel (3), connected with a short bit of light chain. A nice straight lift. A cockpit winch will do the lifting. However, if you have a few pulleys it will reduce the load on the hardtop. Yes, a couple of 2x4 lashed (one over the top, one under) provide a hard point over the engine. Lots of padding protects the cockpit. 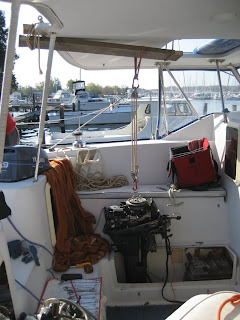 There is no reason to pull the boat to swap engines; just slide them over to the dock on a wide plank (we use a ladder with the center filled in), it is actually easier. Regarding shifting, it is possible that the control levers at the helm are worn. Yup, read your blog. We didn't have lumber on board but a length of tubular webbing did the trick with no harm to the hardtop. Go with the padding recommendation. The lift was easy but the engine clamps required some PB blaster, some patience and an adjustable wrench. Good luck. Thank you Drew and Dan. Both much better ideas than my monstrosity. Drew to access the flywheel on the new XEHB can I remove the 3 bolts for the manual start unit without springs and such flying? Lynn is pleased that her blog is being read. I am no longer getting automatic notice when a topic is responded to, am I missing a new setting? I lowered in new engines (same) just a few years ago and don't recall it being a problem. I used the same 3-bolt bridle.